Remember that song Stephen Sondheim wrote about bleu cheese? Okay. You’re right. 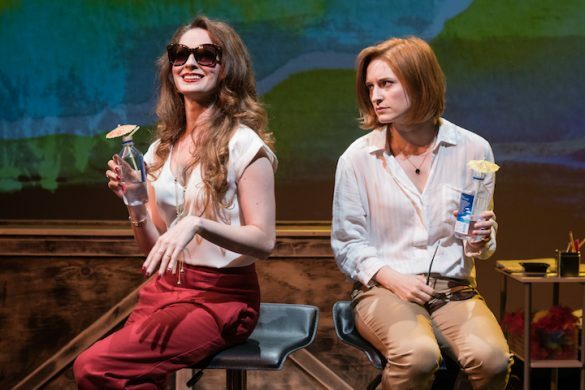 Sondheim did not write an opus to Gorgonzola, but it was a clever addition to the New Jersey Performing Arts Center’s (NJPAC) Annual Spotlight Gala, produced by the Women’s Association of NJPAC. The event, which was held this past Saturday, gathered Broadway’s finest for an evening of songs that celebrated Stephen Sondheim’s 85th birthday. A brief awards video and ceremony kicked off the festive evening, honoring individuals who have made a notable impact in both Newark, where NJPAC is located, and throughout the local arts community. Students (Jaci Coleman, Alexandra Salort, and Jacob Tall) from NJPAC’s arts education program then took to the stage with an impressive three-part harmony rendition of “Comedy Tonight” from Sondheim’s A Funny Thing Happened On the Way to the Forum. 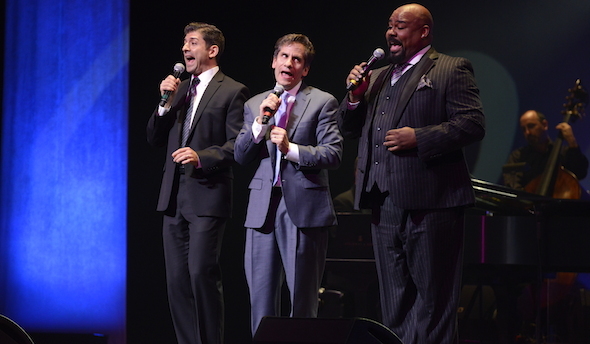 Music Director and the night’s host, Seth Rudetsky, introduced James Monroe Iglehart (Aladdin) and Tony Yazbeck (On The Town), who performed “Agony” from Into the Woods. Iglehart, who is a member of the Broadway hip hop improv group Freestyle Love Supreme, remained onstage and requested a theme from the audience. Someone shouted “Blue Cheese!” and Iglehart proceeded to riff and rhyme on the topic to enthusiastic applause. Other highlights of the evening included a gorgeous duet between Judy Kuhn (Fun Home) and Vanessa Williams (Into the Woods), who performed a medley of “Losing My Mind” (Follies) and “Not a Day Goes By” (Merrily We Roll Along). Cariou then shared an anecdote about how Sondheim told him that he was writing an 11 o’ clock number for his character in A Little Night Music. After book writer Hugh Wheeler had rewritten the scene, Sondheim came back and said, “I’ve written the song, but Frederik won’t sing it. His ex-wife Desiree will.” “Send In the Clowns” was the song, and Cariou—years later—delivered a sensitive and poignant interpretation. Rudestky and his 8-piece band kept the evening moving along as the music director conveyed his usual witty banter with the evening’s stars. The music continues on Oct. 15 as one of Broadway’s finest interpreter of Sondheim songs, Bernadette Peters, takes to the NJPAC stage for a live concert.